Being involved with merchandising in the Retail industry can get many companies swamped in paperwork, and Excelsior Merchanding was no exception. Their contractors were becoming so entrenched in paperwork that it was affecting their speed and effectiveness at each client location. The move to mobile forms was ultimately caused by 100's of hours being wasted on daily report creation and completion, the lack of real-time reporting from client locations, and data errors caused by manual input. The CEO of Excelsior Merchandising, Lauretta Cunningham, approached GoCanvas looking for a way to not only streamline the way that data was being captured but also increase the speed of data collection and reporting in the back office. With the help of GoCanvas Senior Consultants, Lauretta developed a store visit and invoice report within the mobile platform. Each mobile form was client specific and customized based on their unique needs. It allowed the contractors to easily select the report for the correct corresponding store, fill out the merchandising items that fit that specific retailer, and quickly submit the information back to the office for processing. 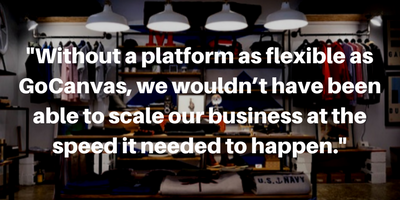 Their new process not only dramatically cut down on the amount of time that it took to service each existing retailer, but allowed Excelsior Merchandising to service 300% new retail accounts than was possible before. GoCanvas has helped Excelsior ensure that all reports are now turned in by 5PM at the end of each day so that proper billing and invoicing can take place for clients and employees alike. Today, client satisfaction has dramatically increased since reports no longer take days or weeks to arrive, but instead get sent within minutes of a contractor leaving their store location. Since rolling out GoCanvas almost 2 years ago, Lauretta and her team at Excelsior have seen major impacts across three areas of their business: 1) Job Performance, 2) Data Reporting, 3) Company Efficiency. Lauretta is now able to pull daily, weekly, and monthly reports for her employees and see who worked where, when, and for how long. This has increased billing accuracy and cut down on unnecessary expenses. She also now has unrivaled access to her store reports with the GoCanvas cloud. She can pull PDF reports in real-time to view photos of each store that was serviced to ensure quality control and customer retention. Overall, Excelsior Merchandising has been able to recover over 3,125 hours in productivity since eliminating paper and deploying GoCanvas.